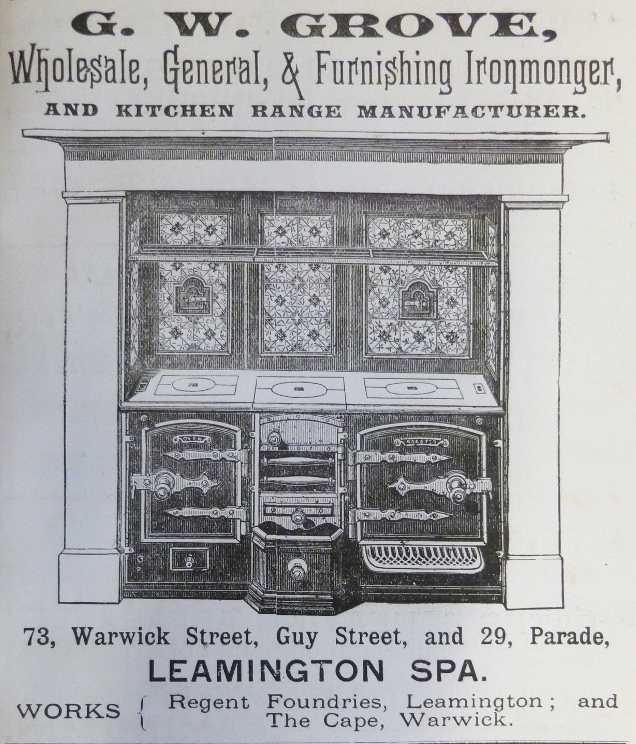 Recent research on local iron-founders and ironmongers has uncovered a quite remarkable man with a busy career in court in the second half of the nineteenth century. The man in the spotlight is George William Grove. He first appears in the Leamington Courier as the executor of a will in 1871. 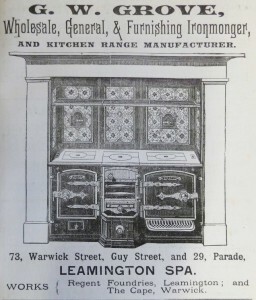 Over a period of time he owned ironmongery shops in Regent Street and Warwick Street and also ran the Regent Foundry in Satchwell Street and at the Cape, Warwick. During his lifetime he also built up a substantial portfolio of rented properties in Leamington. Virtually every year from the early 1870s onwards he appeared in the court pages of the Courier. Grove’s career in the courts began in 1873 when he prosecuted a boy who stole two pears from his garden in Leam Terrace East, and in 1877 he was in dispute about how much petrol was in a barrel. In 1881 he sued a builder for the cost of work and materials provided by Grove, but in 1882 Grove himself was sued for not paying for the repair of a boiler. In 1886 Grove sued a higgler (pedlar) for £1 over the price of a dead horse. On three occasions, beginning in 1887, he took apprentices to court for neglecting their duties under the terms of their indentures. Redressing the balance a little, he was sued around this time by at least two employees for unpaid wages of about £1 10s. In 1889 an employee was prosecuted for stealing coal from Grove and in the same year Grove himself was in court because he did not pay for a cart which he had hired to carry coal. On a different tack, in 1890 Grove appeared in court for failing to prevent noxious smells emanating from a house he owned in Regent Street. In a more trivial case he was reprimanded by a judge when he sued for payment of goods without having any evidence that the goods had ever been delivered. Grove agreed that he did not know whom he should sue but felt sure that he was entitled to sue someone. Heading off in a new direction, he was again in court in 1894 with a dispute about the ownership of a party wall. Sadly, in a tragic case for which no blame was allocated, a young employee of Grove died in 1898 after molten metal was spilt on his foot at a foundry. In 1903 Grove took a tenant to court for damaging windows at a cottage owned by Grove at Newbold Cottages. For variety, in 1904, Grove himself was summoned for leaving out a cycle-rest in Warwick Street after permitted hours. In 1905 he was also prosecuted for having a chimney fire at 27 Parade (Lansdowne Place) and in the same year he sued a tenant for removing furniture from his property without permission. Despite, or perhaps because of, his combative attitude, Grove was also very well-informed and wrote to the Courier in 1899 advocating the use of electricity for streetlights and for it to replace horses on the trams (which actually happened six years later). In 1908 George William Grove died at 27 Lansdowne Place, (Upper Parade, Leamington) and even his will was very complex and legalistic. It appears that this intriguing character was also a devout Christian and he left a building and land at the Cape to St Mary’s church at Warwick. George William Grove clearly never wished to negotiate, compromise or to forgive and forget. He certainly kept the courts busy for several decades.